Agco introduces European technology into North American product line. The Hesston by Massey Ferguson DM1300 series of the Butterfly Mower, introduced by Agco in its August new product launch, is an example of how Agco is moving to introduce European technology into products for the North American market. The DM1300 is a 30-foot mower than can cut 30 acres an hour. It features a breakaway system that bounces up and over obstacles encountered in the field to prevent damage to equipment or injury to the operator. 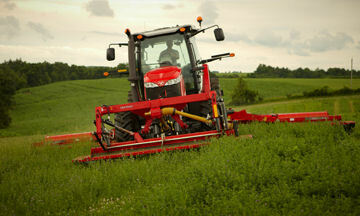 HAY IN A DAY: The DM1300 series 30-foot Butterfly Mower was part of Agco's new product launch in August. It carries the Hesston by Massey Ferguson brand. A single DM130 model front-mount mower and two DM1398 rear-mount mowers can be combined. Cutting height can be adjusted between 1.5 and 2.8 inches with a simple-to-reach hand crank. The DM1340 offers a 17-inch headland lift and 26 inches of total up and down tilt and hydraulic side-shift capable of moving 8 inches side to side. Mowers can be parked in upright transport position to save storage space.